Returning from London in October 2018 as the sole winner of the United Nations’ (UN) World Federation of Engineering Organizations (WFEO) Young Engineers competition, I found it to be somewhat a déjà vu experience. Back in 2015, I went to California, proudly flying the Singapore flag, to receive my American Water Works Association’s PhD prize – the first ever award for a doctoral dissertation outside of North America since 1966. I was reminded of how Singapore, a nation scarce in natural resources and densely populated, could be so successful in rolling out its sustainability and environmental policies. In fact, the sustainability movement has evolved globally with most governments and private entities being acutely aware of environmental issues, and many viewing the environment as a strategic asset and a source of economic opportunity. This is evident at the 24th Conference of the Parties to the United Nations Framework Convention on Climate Change (COP24) where conversations are around limiting global warming. Many on ground observations have already outpaced what the modelling and simulations have been warning us about, and it is timely to consider climate change adaptation more seriously than mitigation. The philanthropic project which I led for the Hlaing Thar Yar township in Myanmar when I was the Deputy Director for Nanyang Environment & Water Research Institute Community Development (NEWRIComm) at Nanyang Technological University (NTU) illustrated the intricate complexity of our environment, and the importance of social and economic consideration, in providing safe water to an under-served community. Striking a balance is key to the success of the project with coordinated planning and execution. Hlaing Thar Yar is a large industrial city in the Yangon region. A severe Cyclonic Storm Nargis hit the city in early May 2008, which caused the worst natural disaster ever recorded in the history of Myanmar. Following the disaster, the community was forced to live in slum-like conditions. The city was ill-equipped with proper waste and water management systems. The community did not have access to clean water due to the polluted brackish underground water in the area. As a result, it had to purchase portable water for their daily needs. The Don Bosco School in HIaing Thar Yar which serves 350 children and parishioners through school programmes and religious activities was in dire need of access to clean water. The only water source within reasonable proximity from the school’s compound is its polluted saline ground water. To provide a proper water management system, we proposed a Reverse Osmosis (RO) treatment system (please refer to Illustration 1) designed to produce 5-10 cubic metres of drinking water daily. To ensure that the system is protected from natural elements like soil conditions, supporting civil and structural components were designed in-house for quality assurance and cost effectiveness. It is known in the industry that the utilisation of an RO system is energy intensive and expensive, and may not be suitable for community development projects. This is compounded by the extensive pre-treatment required which results in higher operational costs. System is designed at 1m3/h average production with double capacity at maximum. 1500 pax @ 10m3/day = 6.8L/pax/day for only essential drinking and cooking according to WHO guidelines that requires minimum 5.5L/pax/day. Hence, a sustainable model was formulated to ensure that the resources required for water production is sufficient for the community to operate and maintain. Affordability in the production of water remained key for this project. The engagement with local authorities, village head, the school and community resulted in a positive and meaningful outcome. The school was subsequently appointed as the overall-in-charge to manage the operations and maintenance of the RO treatment system. Designed with the community in mind, the project which was funded by the Lien Foundation, utilises proven technology to achieve the most economical and sustainable solution for water management & treatment. Critical instrumentation like pressure transmitter, conductivity meter and oxidation-reduction potential are placed at various process stages for continuous monitoring. These stages are conscientiously selected for the project for their simplicity, ease of maintenance and ability to support the concept of affordability at its core. To do this, we had to understand intrinsically the process and importance of control and automation. The most common cost of failure in an RO system is the ineffective pre-treatment process. This often results in poor reliability of the system, degrading life span of membrane and high operating cost. Overdosing of coagulants and overfeeding of chlorination will also cause common failures which affect the RO system. To prevent such problems, process instrumentations are used to monitor critical parameters such as differential pressure, conductivity, oxidation, and early warning signs of pre-treatment failure. 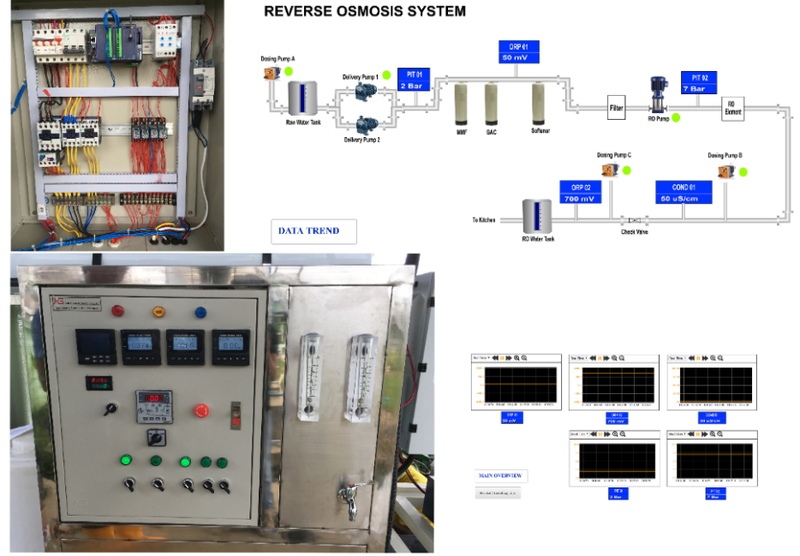 Another main concern in today’s conventional water treatment control system is that they lack the ability to communicate all processes monitoring from a centralised location, especially at remote location(s). Also, this complex control system requires skilled operators to monitor and control the process operation. In the case of Don Bosco School, the locals are not trained in this field. And to resolve these issues, an IoT (Internet of Things) protocol was introduced to allow remote monitoring of the process. The International Finance Corporation (IFC) Performance Standards is widely accepted as a global standard to ensure projects are developed in a sustainable fashion – conserving natural resources, protecting people’s livelihoods and promoting project benefits. The Performance Standards provide guidance on how we can identify and manage risks and impacts, as well as outlining requirements for stakeholders’ engagement and disclosure obligations. In addition, projects must also conform to in-country regulations and international obligations. Through funding from the Lien Foundation, NEWRIComm has embraced the IFC concept which exhibited the essence of sustainability in evaluating the project, ie assessment with the community in mind. This is essentially what global international financing and aid funding organisations, including the World Bank, Asian Development Bank, African Development Bank, AusAid, US Millennium Challenge encompass. It is important that social and environmental sustainability hold equal weightage in delivering a sustainable and resilient infrastructure to alleviate poverty. The Hlaing Thar Yar township project, administered by NEWRIComm and funded by Lien Foundation, provides for the improved development of the community. I quote from Chairman of Surbana Jurong and Changi Airport Group, Mr Liew Mun Leong’s book, entitled: Sunday Emails from a Chairman (Volume 5, 20th Anniversary Edition, Page 91), “Economic studies have proven that a development strategy based on sustained, large-scale investments in strategic infrastructure projects can contribute significantly to a country’s economic growth”. I resonate strongly with Chairman’s sharing. We need to be conscientious that for infrastructure to be sustainable, it needs to gain wide acceptance by the community-at-large, which paves way in exhibiting its full value to support inclusive human development. Failure to do so will only result in a building or structure with no purpose or a state of derelict, i.e. the common notion of a white elephant. This infrastructure is meant to serve the people. Any infrastructure will need to be designed with end-users in mind, so it will be taken care of like its own. The financier, consultants, developers, and owners have profits to make, which sometimes result in the community being forgotten and forsaken. Without the inclusion of community, it is only a short-term gain without an equitable long-term framework for a sustainable and continuous development. Take more calculated risks. We need to innovate continuously, and not rely on others to do the work for us. Tap on one another’s network and expertise, to provide quality proposals and deliver projects on time and on budget. While we may be superior in terms of techniques and knowledge, we need to remember that we must never take this as an entitlement. Every country has its own rules and culture, local knowledge is more important than what the best technology can bring. NEWRI is part of the Nanyang Technological University, Singapore and is globally ranked amongst the top research organisations in the environment & water domain. NEWRIComm has been conferred multiple accolades, including the NTU Humanitarian Award 2018, and both ASEAN Outstanding Engineering Achievement Award and IES Prestigious Engineering Award in 2017 – for its novel and innovative solution in a community development project in Sri Lanka.